Monday, Monday - what a lovely start to the week I have had already. I know it when I woke up that the day was going to be great. My weekly Operations Meeting at work was cancelled! 2 hours gained, yahoo! Not too exciting of a weekend...here is the scoop. I worked on Saturday at the CG. 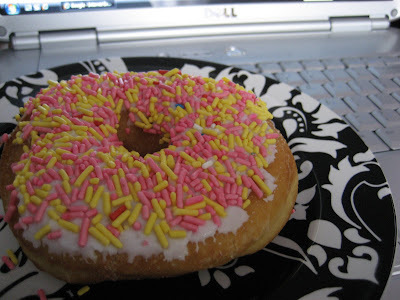 But before I went, Tim brought me my favorite, sprinkled doughnut and coffee for breakfast. Not only did I get to get jacked up on sugar, caffeine too! Yes, I ate it at my computer. I taught a quick gifts class that was a lot of fun. I made some cute magnets to boot! Saturday night Tim and I just hung out at home and watched some TV shows we had saved on our DVR. Sunday, I slept in and missed beating the crowd to the museum - so much for my master plan. So, I decided to stay home and work on some personal stuff - called my Mom, cleaned out some magazines, made candy for Timmy and relaxed a bit (which was great). Hope your Monday is as good as mine! My boss just walked in and said he has to leave early and is out of here - YESS! So many blessings!